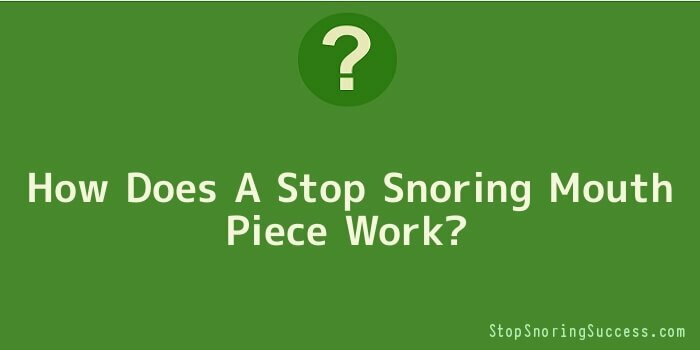 How Does A Stop Snoring Mouth Piece Work? Are you looking for a mouth piece that will be able to help you stop snoring? If you are then let this short article enlighten you. Though there is a limited research on the exact number of people who have a snoring problem all over the world, many experts believe that a rough estimate would be at least 30% of the entire population. This is probably the reason why medical experts and health and fitness companies alike are on the never-ending search for different ways that can eventually put an end to snoring. Whether it’s nasal strips or certain techniques in sleeping, there are a number of different solutions that can help stop you from snoring. If you’re inclined towards using a mouth piece, then here’s a short description on how most of the popular models work. Designed to stop your throat tissues from collapsing – in order to stop you from snoring, the first thing that a mouth piece should do is to address the main cause of the whole problem and that is the throat tissues’ tendency to relax. You need a mouth piece that is designed to stop this from happening so that your throat won’t vibrate when you breathe in and out while sleeping. Prevents your tongue from blocking your air passage – another important function that the mouth piece has is that it stops your tongue from sliding back, which can then prevent your air passageway from becoming blocked. As this is one of the most common problems that snorers have, many mouth pieces nowadays have been designed to combat this specific problem. Forces you to breathe through your nose instead of your mouth – lastly, as many experts now recognize the importance of breathing through your nose rather than your mouth, many mouth pieces are dedicated to correct your breathing technique, especially when asleep. There are many types of mouth pieces that have the potential to help you get rid of your snoring problem for good. The key is to find one that will perfectly suit you. Make sure to ask help from your doctor in choosing one. This way, you’ll be able to find the most comfortable type for you. Though it’s not very common to hear stories of teeth becoming affected by mouth pieces, it’s best to look out for this side effect nonetheless. If your mouth piece feels too tight or too uncomfortable for you, then by all means, make sure you switch to a model that is just the right fit for you. Ask the help of your dentist in settling for one that won’t damage your teeth if you don’t want to waste a lot of money on a bunch that you won’t be able to use in the long run. Last but not the least; make sure you have a means to track your condition to see if it’s improving or just worsening. Rely on the cooperation of the people who live with you to give you feedback on the issue. This is the only way you’ll know if using a certain mouth piece can be considered as a success in curing your snoring problem.